U.S. Navy F/A-18 approaching the sound barrier. The white cloud forms as a result of the supersonic expansion fans dropping the air temperature below the dew point. 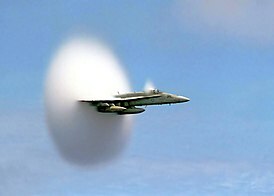 At the beginning of the 20th century, the term "supersonic" was used as an adjective to describe sound whose frequency is above the range of normal human hearing. The modern term for this meaning is "ultrasonic". Etymology: The word supersonic comes from two latin derived words; 1) super: above and 2) sonus: sound, which together mean above sound or in other words faster than sound. The tip of a bullwhip is thought to be the first man-made object to break the sound barrier, resulting in the telltale "crack" (actually a small sonic boom). The wave motion traveling through the bullwhip is what makes it capable of achieving supersonic speeds. Most modern fighter aircraft are supersonic aircraft, but there have been supersonic passenger aircraft, namely Concorde and the Tupolev Tu-144. Both these passenger aircraft and some modern fighters are also capable of supercruise, a condition of sustained supersonic flight without the use of an afterburner. Due to its ability to supercruise for several hours and the relatively high frequency of flight over several decades, Concorde spent more time flying supersonically than all other aircraft combined by a considerable margin. Since Concorde's final retirement flight on November 26, 2003, there are no supersonic passenger aircraft left in service. Some large bombers, such as the Tupolev Tu-160 and Rockwell B-1 Lancer are also supersonic-capable. Most modern firearm bullets are supersonic, with rifle projectiles often travelling at speeds approaching and in some cases well exceeding Mach 3. Most spacecraft, most notably the Space Shuttle are supersonic at least during portions of their reentry, though the effects on the spacecraft are reduced by low air densities. During ascent, launch vehicles generally avoid going supersonic below 30 km (~98,400 feet) to reduce air drag. When an inflated balloon is burst, the torn pieces of latex contract at supersonic speed, which contributes to the sharp and loud popping noise. To date, only one land vehicle has officially travelled at supersonic speed. It is ThrustSSC, driven by Andy Green, which holds the world land speed record, having achieved an average speed on its bi-directional run of 1,228 km/h (763 mph) in the Black Rock Desert on 15 October 1997. Richard Noble, Andy Green and a team of engineers are currently planning to break this record in 2019 at Hakskeen Pan in South Africa with the Bloodhound SSC hybrid jet- and rocket-propelled car. Supersonic aerodynamics is simpler than subsonic aerodynamics because the airsheets at different points along the plane often cannot affect each other. Supersonic jets and rocket vehicles require several times greater thrust to push through the extra aerodynamic drag experienced within the transonic region (around Mach 0.85–1.2). At these speeds aerospace engineers can gently guide air around the fuselage of the aircraft without producing new shock waves, but any change in cross area farther down the vehicle leads to shock waves along the body. Designers use the Supersonic area rule and the Whitcomb area rule to minimize sudden changes in size. The sound source has now broken through the sound speed barrier, and is traveling at 1.4 times the speed of sound, c (Mach 1.4). Because the source is moving faster than the sound waves it creates, it actually leads the advancing wavefront. The sound source will pass by a stationary observer before the observer actually hears the sound it creates. However, in practical applications, a supersonic aircraft must operate stably in both subsonic and supersonic profiles, hence aerodynamic design is more complex. One problem with sustained supersonic flight is the generation of heat in flight. At high speeds aerodynamic heating can occur, so an aircraft must be designed to operate and function under very high temperatures. Duralumin, the traditional aircraft material, starts to lose strength and go into plastic deformation at relatively low temperatures, and is unsuitable for continuous use at speeds above Mach 2.2 to 2.4. Materials such as titanium and stainless steel allow operations at much higher temperatures. For example, the Lockheed SR-71 Blackbird jet could fly continuously at Mach 3.1 which could lead to temperatures on some parts of the aircraft getting above 315 °C (600 °F). Another area of concern for sustained high-speed flight is engine operation. Jet engines create thrust by increasing the temperature of the air they ingest, and as the aircraft speeds up, friction and compression heat this air before it reaches the engines. The maximum allowable temperature of the exhaust is determined by the materials in the turbine at the rear of the engine, so as the aircraft speeds up, the difference in intake and exhaust temperature that the engine can create decreases, and the thrust along with it. Air cooling the turbine area to allow operations at higher temperatures was a key solution, one that continued to improve through the 1950s and on to this day. Intake design was also a major issue. 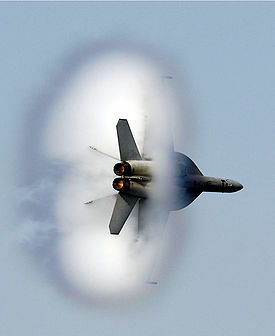 Normal jet engines can only ingest subsonic air, so for supersonic operation the air must be slowed down. Ramps or cones in the intake are used to create shock waves that slow the airflow before it reaches the engine. Doing so removes energy from the airflow, causing drag. The key to reducing this drag is to use multiple small oblique shock waves, but this was difficult because the angle they make inside the intake changes with Mach number. In order to efficiently operate across a range of speeds, the shock waves have to be "tuned." The key to having low supersonic drag is to properly shape the overall aircraft to be long and thin, and close to a "perfect" shape, the von Karman ogive or Sears-Haack body. This has led to almost every supersonic cruising aircraft looking very similar to every other, with a very long and slender fuselage and large delta wings, cf. SR-71, Concorde, etc. Although not ideal for passenger aircraft, this shaping is quite adaptable for bomber use. Aviation research during World War II led to the creation of the first rocket- and jet-powered aircraft. Several claims of breaking the sound barrier during the war subsequently emerged. However, the first recognized flight exceeding the speed of sound by a manned aircraft in controlled level flight was performed on October 14, 1947 by the experimental Bell X-1 research rocket plane piloted by Charles "Chuck" Yeager. The first production plane to break the sound barrier was an F-86 Canadair Sabre with the first 'supersonic' woman pilot, Jacqueline Cochran, at the controls. According to David Masters, the DFS 346 prototype captured in Germany by the Soviets, after being released from a B-29 at 32800 ft (10000 m), reached 683 mph (1100 km/h) late in 1945, which would have exceeded Mach 1 at that height. The pilot in these flights was the German Wolfgang Ziese. On August 21, 1961, a Douglas DC-8-43 (registration N9604Z) exceeded Mach 1 in a controlled dive during a test flight at Edwards Air Force Base. The crew were William Magruder (pilot), Paul Patten (copilot), Joseph Tomich (flight engineer), and Richard H. Edwards (flight test engineer). This was the first and only supersonic flight by a civilian airliner other than the Concorde or Tu-144. ^ "APOD: 2007 August 19 - A Sonic Boom". antwrp.gsfc.nasa.gov. ^ "F-14 CONDENSATION CLOUD IN ACTION". www.eng.vt.edu. Archived from the original on 2004-06-02. ^ "Jacqueline Cochran and the Women's Airforce Service Pilots." National Archives and Records Administration: The Dwight D. Eisenhower Presidential Library, Museum, and Boyhood Home. Retrieved: July 10, 2013. ^ Masters, David (1982). German Jet Genesis. Jane's. p. 142. ISBN 978-0867206227. ^ a b Wasserzieher, Bill (August 2011). "I Was There: When the DC-8 Went Supersonic". Air & Space Magazine. Archived from the original on 2014-05-08. Retrieved 3 February 2017.